A boy (15), accused of attempted murder, allegedly claimed to be a member of the UDA after going to the Limavady home of a “vulnerable” youth whom he accused of being a “drug dealer,” a court heard on Friday. The defendant, who cannot be named because of his age, and who has an address in the Limavady area, was allowed to sit outside the dock when he appeared at Coleraine Magistrates Court. The youth faces a total of eight charges relating to an incident in Limavady in the early hours of Thursday December 28. He is charged with attempting to murder an 18-year-old male; possession of an offensive weapon - a knife - with intent to commit murder; damaging a coat belonging to the victim and attempting to cause the victim to leave his home due to a threat. He is also accused of assaulting two police officers; resisting police and damaging the interior of a police vehicle. Also in court was a co-accused, Padraig Brolly (18), whose address was given as Rosseden Drive, Limavady. He faces five charges including attempting to cause grievous bodily harm with intent to the alleged victim; possession of a hatchet with intent to commit criminal damage; damaging a fence belonging to the victim’s mother and attempting to cause the victim to leave his home due to a threat. Brolly is further accused of possessing cannabis. When the 15-year-old was brought in to court he said: “Good morning Judge”. A police officer said he believed he could connect both defendants to the charges. A defence solicitor for the 15-year-old said no bail application was being made for his client. Brolly’s defence solicitor Paddy McGurk did apply for bail. The police officer said that at 3.15am on December 28 the two accused approached the rear of a house in Limavady where a woman and her 18-year-old son who has “learning difficulties and is classed as vulnerable” were inside. The woman had been sleeping in a bedroom and heard a commotion outside and shouted down to two men. The officer said the woman said the 15-year-old “proclaimed to be a member of the UDA and that her son was a drug dealer and had to get out”. The policeman said the woman alleged Brolly was waving what looked like a foot-long hatchet “around his head” and used it to damage a fence post. The officer said the woman said police had been called and the two men left and she woke up her son. A short time later, said the policeman, Brolly and the 15-year-old returned and the younger man again mentioned the UDA and drugs and said her son “had to get out”. The officer said the woman said Brolly was running around a parking area waving a hatchet “like an Indian you would see in the movies”. The officer said the 18-year-old victim, “due to his own anger issues,” then ran outside and his mother claimed she saw the 15-year-old “thrusting an object twice towards the chest of her son”. The officer told the court that “luckily enough there was no major injury” but damage was caused to a coat and marks were left on his chest. 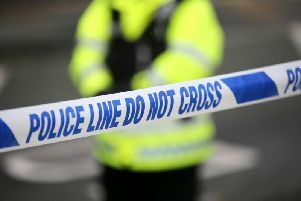 Police then searched for the men and at 10.15am on Thursday police were alerted by the 15-year-old’s family that the boy was trying to dispose of evidence. Police arrived and had to handcuff and put leg restraints on him and the boy spat out at police. The police officer told the court Brolly contacted a solicitor and made himself available for interview on Thursday and said he was at the scene but denied having a hatchet. The officer said Brolly said the co-accused had a knife and tried to stab the injured party. The policeman said the weapons had not been found. He said Brolly had 35 previous convictions and he feared he could commit further offences and there was a chance of him absconding if released on bail. The officer also had concerns about potential intimidation of witnesses. Solicitor Paddy McGurk said Brolly had voluntarily handed himself in and the officer confirmed the defendant had admitted being at the scene and had given his version of events. Mr McGurk said his client had a potential address with his father near Dungiven. Judge McNally said whilst the weapons had still not been found and full interviews with witnesses had not yet taken place he was concerned about a potential interference with witnesses and refused bail for Brolly. The judge said he was not going to tolerate verbal abuse from the dock and the boy’s solicitor said his client wished to apologise. Judge McNally then said as it was approaching the end of the year he was not going to impose a sentence but said it could have been for up to 28 days. The judge then ordered him to be brought back and added: “In light of your final comments I have decided the apology was worth absolutely nothing,” and jailed him for 14 days for contempt of court.